Welcome back readers. February turned out to be a good month for me. 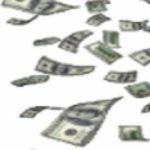 I was able to set a new February record high for dividend income. The market has been seeing plenty of volatility lately. It goes up and then it goes down. There are opportunities out there but it’s a matter of finding them. I have been looking at some stocks to buy but so far I haven’t found any that I thought would work well in my portfolio. When looking at stocks I have to keep in mind factors including portfolio allocation, market trends and fundamentals of the company. I am hoping to find some opportunities that will work for my portfolio soon. 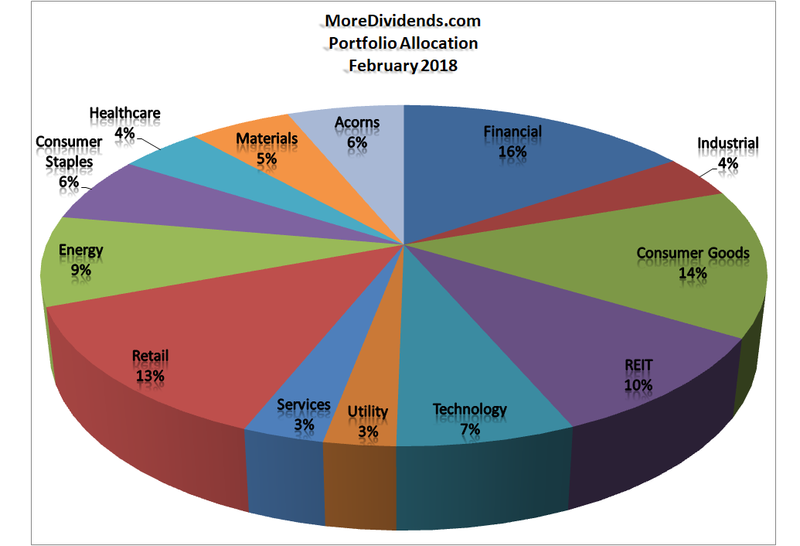 Until then let’s take a look at how February turned out for More Dividends. As mentioned above there were no major purchases made during February. The 2nd month of the quarter has a new record for the amount of dividend income received. February was the 2nd month of Q1 and accounted for $45.54 of my 2018 Dividend Income. In total during 2018 I have earned $56.78 in dividend income! That is 5.7% of my 2018 goal. 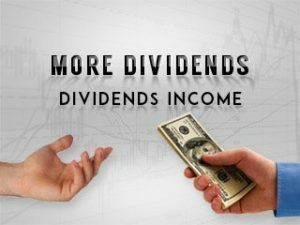 Year over year, I saw a 56.9% increase in dividends earned during the month of February. That is some great YOY growth in dividend income received. 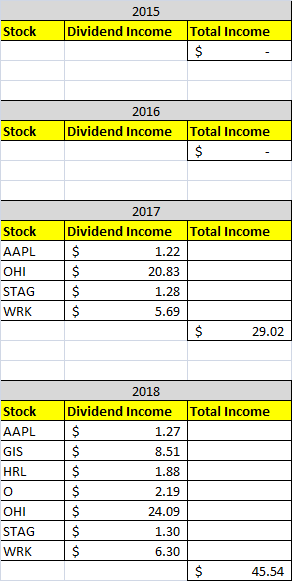 This month is really starting to blossom when it comes to dividend income. Hopefully the income during the month will continue to grow. Since I didn’t make any major additions to my portfolio all changes in the allocation is because of the market fluctuations and reinvested dividends. I have started taking a look at my allocation more while I am looking for more buying opportunities. Just like my allocation, the only changes you will see here is because of changes in the market and reinvested dividends. This month I published 6 articles. Here are the articles that I posted on here during February from oldest to newest. With February now in the books I am very pleased with how it turned out. 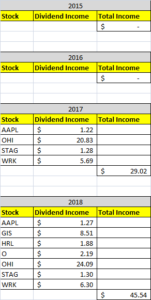 I was able to receive some nice dividend income from some good companies. I also got several announcements about increased dividends that will be coming in the future. Plus I am still shopping around for some more stock to buy and add to my portfolio. I am looking forward to everything that March has to offer in the form of dividend income and stock purchases. Since I am currently shopping for some new stock purchases I would love to hear about any recent buys that you have made. Yeah, any increase is a good increase! Thanks for stopping by Tom. Looks like 2018 is looking good. Congrats on an awesome month. Do you use Acorns for investing? Thanks dividendgeek. Yeah, I use Acorns. I have it set up to auto contribute $30 a week. Nice income and growth. Why not add to general mills on their dip? One i have been watching but they are in my top holdings already. Thanks PassiveCandianincome. I have been thinking about adding to General Mills but it is one of my larger holdings as well. I do have some dry powder…. just not sure where to put it yet lol. Good job. and nice YOY . we share 4 companies keep it up. Thanks Doug. I’m glad to be a fellow shareholder with you. Hopefully I will be able to continue producing yoy growth like this. Thanks for stopping by. Nice job and great y/y growth. Early on it’s important to just keep investing and see that big growth! Thanks TITM. I am hoping to continue with such good yoy growth so I try to add as much as I can when I can. Thanks for stopping by! Looking good MD. As time goes on and those dividend increases and fresh capital gets added the dividends you receive will just keep climbing higher and higher. I made a small purchase of MO earlier this month and missed out on a very small starter position in DLR. If DLR dips back to below $100, preferably closer to $95 I’ll pick up a few shares. Best of luck finding some stocks to buy. Thanks JC. I’m slowly building that snowball up. I might do some research on these two stocks and see how they would fit into my portfolio. Thanks for stopping by! Congrats on a record setting month. Always nice to achieve a higher milestone when it comes to passive income earned. Keep collecting those dividends and reinvesting. It all helps move that snowball along much faster. Nice to see a couple names in common too. Thanks DH. Yeah, I can’t wait to break the $100 in one month milestone. I got a long way to go but I am well aware that I have already came a long way so far. All dividends are reinvested back into the snowball and it really makes a big difference. Knowing that we both hold some of the same stock just lets me know that I am doing something right. Thanks for stopping by. Nice breakdown MD! I really like those charts you have and exposure to a bunch of different sectors. Great Job! Congrats on a record month! Thanks for stopping by Money Hungry. I appreciate the kind words. Those charts help me keep a grasp on what’s going on with my portfolio. When I am looking at adding to my portfolio I always refer to those charts before I make the final decision.